Product prices and availability are accurate as of 2019-04-19 07:53:02 UTC and are subject to change. Any price and availability information displayed on http://www.amazon.com/ at the time of purchase will apply to the purchase of this product. The CDM Gear BMTA1 light mount with 3 slot rail holds the light between the barrel and tube for fingertip actuation of lights on either the left or right side of the shotgun. It can use optional 5 slot or 3 slot rails for mounting additional lighting or a laser on the other side. One tool for one bolt is all that is needed to attach and remove this clamp in seconds. Comes with all wrenches and 3M polyurethane no slip grip pads to protect your finish. Includes a built in non rotational sling swivel cup for QD PB sling swivels. With illumination and targeting systems getting smaller, lighter and more compact, we're moving with the industry, law enforcement and the military to provide a superior mounting platform that provides for a stronger, lighter, less complicated attachment for your weapon. Fits Mossberg 590A1 and Mossberg 930 SPX with 1" diameter tube. Fits Mossberg 590A1 and Mossberg 930 SPX with 1" diameter tube. 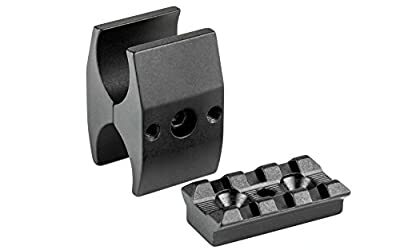 light mount with 3 slot rail holds the light between the barrel and tube for fingertip actuation of lights on either the left or right side of the shotgun.